Dorothy Wilks’ latest book, Filet Crochet; Learn the Timeless Art of Filet Crochet, introduces you to the age old art of Filet crochet. With Filet crochet you can create stunning pieces of art by crocheting pictures into flat crochet using solid mesh and open mesh stitches. Used with thread and just about any weight of yarn, Filet is one of the most enduring and popular forms of crochet. In her book Dorothy introduces you to the basics of the Filet technique, the stitches used and how to crochet them, how to read a graph pattern, and how to crochet your very first Filet project. 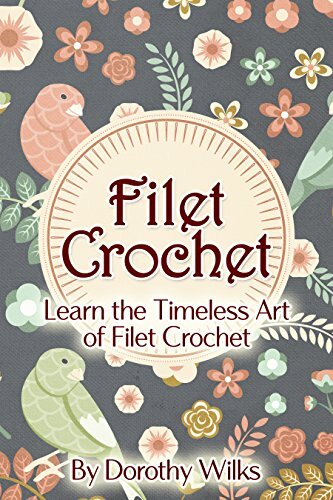 With her easy to understand instruction and clear images you will learn how to Filet crochet in no time. Dorothy also includes her own original easy Filet patterns for you to practice your newly learned skills. She also includes a size chart for afghans so that you can create your own Filet afghan in sizes ranging from receiving blankets to king size beds. She also explains the math and how to figure out how many Filet motifs you will need for an afghan. Each stitch and step is fully explained and she also encourages you to create your own Filet charts. If you’ve always admired the delicate beauty of Filet crochet and you know how to crochet a chain stitch, single crochet, and double crochet stitches, this book is your first step to learning how to not only crochet Filet stitches, but how to read a Filet chart. Don’t miss out on this great resource and welcome addition to any crochet artist’s library. Borrow this Great Book TODAY!! Download this Bestselling Book Now! !